When college student Jessica Hollie took the mic at the Oakland City Council meeting on December 20, clad in a mauve blouse, pearls, and slacks, she didn't look the part of the stereotypical Oakland occupier. "Money is speech and power, and I'm a student — I don't have that type of power. So I have to come down here and get six minutes just to try to get you to hear me out," Hollie said. "People are choosing to go to Occupy, where they feel their voices will be heard, because they've become disengaged and jaded with our political system. "I'm not a crazy hippie, I'm not an anarchist, I have faith in our system, but I need the people I voted for to represent me," she continued. "I'm very proud of my city, and I'm an Oaklander to the heart, but I want to make sure this city can push forward. "Who's going to run for city council next?" Hollie asked. Someone from the crowd yelled out: "You!" But two weeks later, on January 5, there was no pushing forward. City Hall doors were locked to Oakland's occupiers. 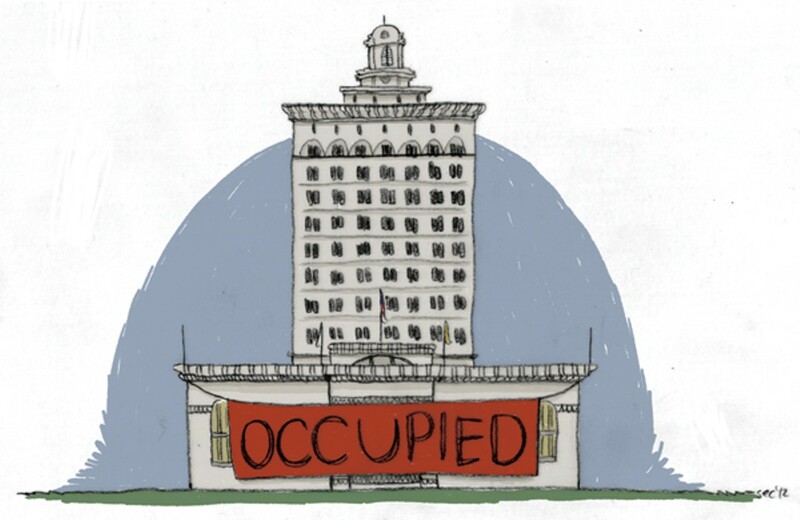 Following a dozen arrests in the plaza the night prior, Occupy Oakland activists planned to occupy City Administrator Deanna Santana and Mayor Jean Quan's offices, but were shut out of City Hall for hours. A four-person delegation from the interfaith group was allowed to meet with Assistant City Administrator Arturo Sanchez and Quan's chief of staff Anne Campbell Washington. Not long after the delegation reported back to the rest of the occupiers, two were arrested at City Hall's south doors. 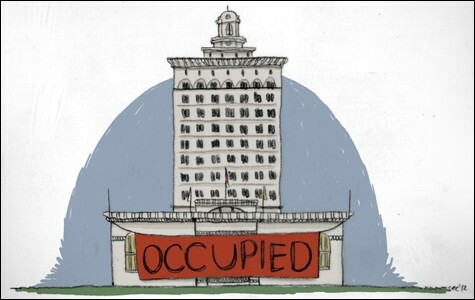 For several weeks, the City Hall building at the west end of Frank Ogawa Plaza loomed over Occupy Oakland, untouched. Now some occupiers can't wait to get inside. Much has changed at Occupy Oakland since the evening in late October when Quan was booed out of a general assembly after expecting to speak without waiting her turn. Several camp raids and more than two hundred Occupy-related misdemeanor and felony arrests have further shifted the focus of Oakland's occupation from national issues of wealth inequality to every day struggles for what occupiers say is their First Amendment right to peaceably assemble in Frank Ogawa Plaza. A campaign against big money has in large part become a campaign against a mid-size and troubled municipality. While some other Occupy outposts, such as Los Angeles, have civic engagement committees dedicated to attending city council meetings and making their voices heard, Occupy Oakland has had a stance against cooperation with city officials and prescribed laws, such as closed park hours, since the plaza camp was first established on October 10. "For me, the Occupy movement, and especially its stance of non-negotiation with city officials, is an expression of a deep breach of faith that many of us feel between themselves and their government," said Nichola Torbett, director of Seminary of the Street and a member of the interfaith delegation that met with city officials on the 5th — to issue "demands," not engage in negotiations. "The climate of eroding civil liberties makes it important not to ask permission for something that is actually a right." But instead of making those demands somewhat symbolically in the form of tents on the plaza, some occupiers are now making them directly, throwing their bodies on the gears of city process instead of just into the streets. The January 5 occupation attempt was the latest in a series of autonomous occupations of City Hall and direct, close-quarters confrontations with city officials who have ordered the police crackdowns on Occupy since October. And occupiers have more planned yet. On December 19, following days of what occupiers called police harassment and citations in the plaza, a group of about 25, led by the interfaith coalition, met with Santana outside her office. First, they performed a song and dance about the 99 Percent, complete with Busby Berkeley-esque umbrella twirling. Santana was amused. Then they demanded reasons for the police harassment. Santana said she would respond by email later in the week. The next day, Jessica Hollie and several dozen other occupiers made their voices heard at a nearly six-hour-long city council meeting which focused in part on an emergency proposal that called for increasing force to prevent future port shutdowns. One of these speakers, Occupy Oakland medic Elle Queue, mic-checked city council President Larry Reid after he interrupted her allotted speaker time, but allowed Port of Oakland Executive Director Omar Benjamin to run long. "I never go into these things with the intention of mic checking, and genuinely prefer to work within the approved process for speaking," said Queue. "I think city officials in particular stop listening once the human mic comes into play, and if our goals are to send a specific message to city council, it probably needs to go through more traditional channels in order to be really heard." The events of January 5 were more fraught with emotion, following several arrests the night before in Frank Ogawa Plaza. City Hall's doors were locked long before occupiers moved to the south entrance, asked for entry, and were denied. A tense moment of shoving between police and protesters was followed by a long stand-off. Ultimately, the occupiers were not allowed inside, and were not given a reason for the closure of the public building. Now Occupy Oakland activist and social worker Jennifer Dowdy is working to organize an occupation of the city council meeting planned for January 17, in conjunction with national efforts to Occupy Congress as well as other local government meetings. "People are more awake now," said Dowdy. "It gives me a little hope in humanity when working with this crazy system." At the December 20 meeting, Dowdy said she "noticed how frustrated some of the city council members were that we were there, and we had so much to say. I think just showing up and being able to communicate effectively — that in and of itself will create change. "In social work, we say if you want to change a relationship, you have to switch the dance up," Dowdy continued. "We have to stop doing this apathetic dance with politics." That doesn't mean supporting a particular party or candidate, though. "We don't feel that any of them represent us, so we're going to show up and tell you how we feel," Dowdy added. "That's one place to start." Some occupiers and critics point to the impending split in the national Occupy movement between liberals and radicals, reformers and revolutionaries — those who want to smash the state, and those who want to fix it. "I'm not sure Occupy is interested in going through city council anymore; I think a lot of people feel the time for that has passed," said Elle Queue. "I hope participation in local government doesn't serve as a wedge to drive people apart." Some, though, seem interested in occupying a middle ground — not smashing or patching up, but chipping away, at least for the time being. "We need a whole new economy, and along with that, a revamping of everything from education to government," said Torbett. "But voting is not necessarily inconsistent with this."